1. Decide on a size. 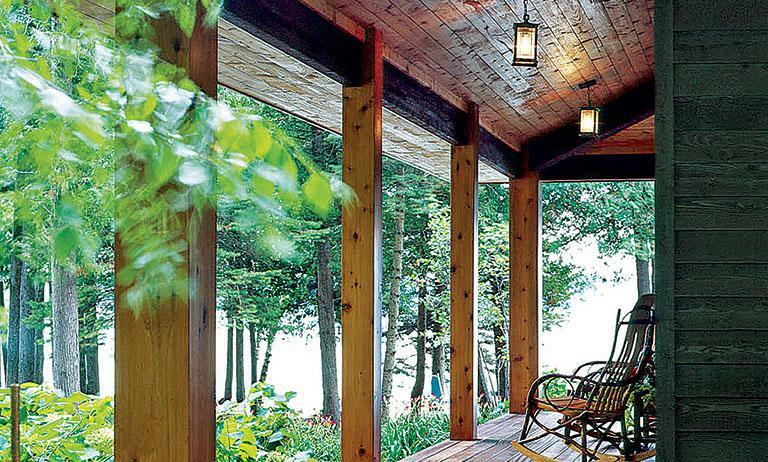 A porch that’s too skimpy can make the wrong first impression and can be difficult to furnish. For a front porch, a depth of at least 4 to 6 feet creates space enough to open the screen door without knocking a visitor back down the steps and allows for a swing or rocking chairs. A porch can be as large as you’d like, but remember that a deep roof can cut the amount of daylight that reaches into your home’s interior. After dark and even on chilly nights, the porch can still make a good gathering space. Overhead lights, table lamps, chandeliers and even candles can work together to make your porch glow. Be sure that all lighting fixtures are rated for outdoor use. For chilly evenings, provide lap quilts or throws. For refreshing breezes on sultry days or evenings, look to a ceiling fan. Pillows, rugs, lampshades and upholstery can all add color and pattern to your porch. Green plants and flowers are a natural for porches, too, but make sure to opt for shade-loving varieties for the deeper recessed areas of your porch.